You guys have been very patient and I didn’t want to put this reveal off any longer….. I plan to take more photos over the weekend and add them here. I’m not at all happy with these. I started working on this chair yesterday…..
….and I know I’m going to catch a little flack for painting it. I asked you guys about this chair a while back. Some were for painting it and a few wanted the original finish restored. I had a paint plan in mind then deviated from it. I should have stuck to the plan. I used a light-medium gray and there just wasn’t enough drama for me. So I’m painting it another color. I removed the seat and started painting…and you guys have heard the story of the paint. I started with gray and it didn’t say “drama” to me so on to another plan. I did like the idea of red as some of you suggested but I had already painted it black and was just waiting on fabric inspiration. I went through all my fabric…tried black velvet….black and white print…..the yellow and gray bird fabric…red satin….then this…..
A shirt of mine that had been added to the fabric pile several months ago. 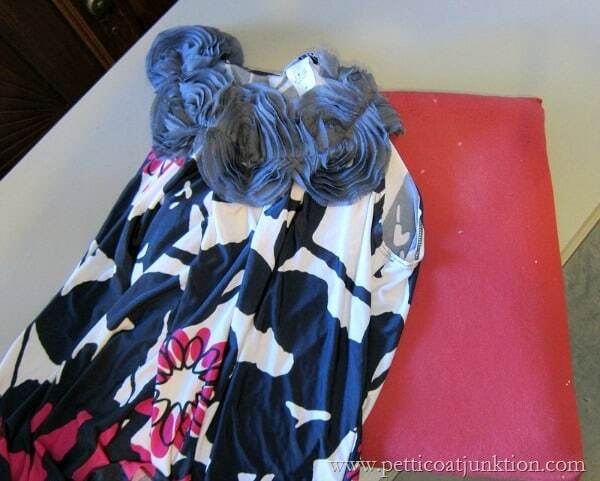 When I clean out my closet and get ready to send things to Goodwill I now look at the pieces with a different eye. I consider if I could use the fabric for a project some time in the future. I picked up this shirt and ta-dah….it was perfect with the black paint….drama and beauty. 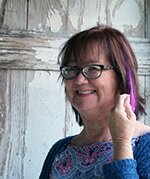 I used the bottom of the shirt so I could get a lot of the fuchsia color. The fabric was really stretchy so it worked great! 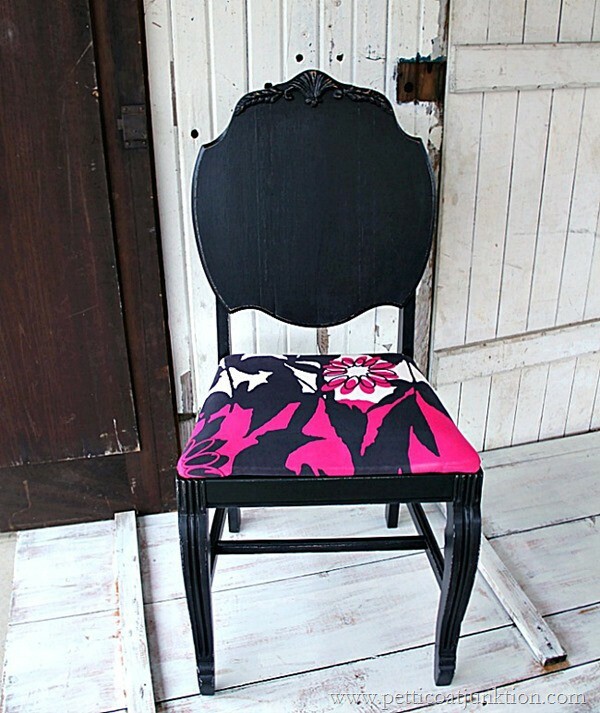 I tried adding a fuchsia stenciled decorative line down one side of the chair back (front actually) but that didn’t work. Thanks for all the comments on my photography post yesterday. ‘back of chair could maybe be painted shiny black? 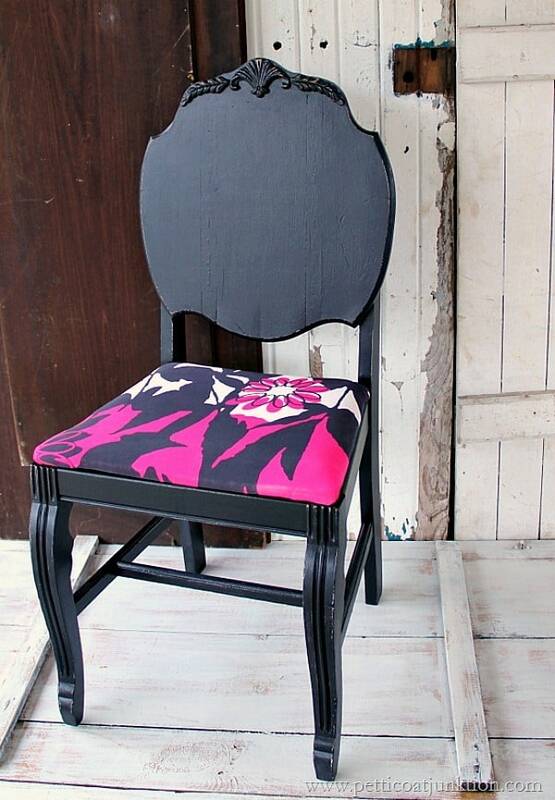 Also liked the idea of French words (Asseyez-vous means “sit down”) but in fuscia and white. Did you save the rosettes from your blouse? Maybe arranging them on the curvy sides of the back? I Just reupholstered some chair seats and now I want to paint the chairs black. It was nice to see how yours looked. 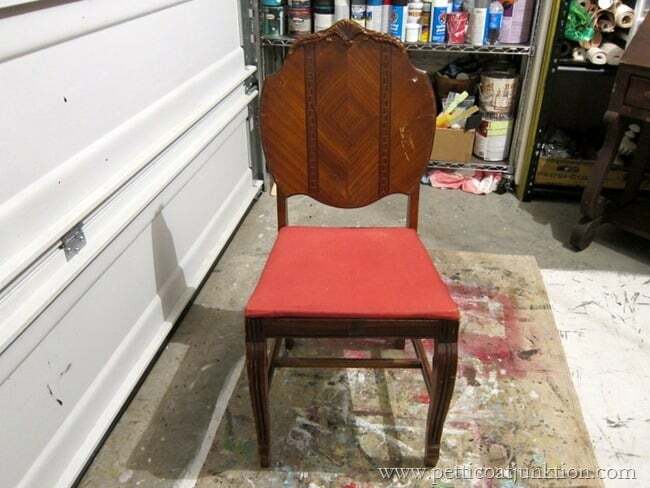 Beautiful chair, I would definately grab that flower pattern and paint a pair, in in two sizes, in a group in fushia on the backrest, off to th left, leave the carving detail alone, I think the floral needs to be the focal point on this… just my two cents worth.. I like MRenaud’s idea- a word in white would be interesting and fun or a phrase. Joie de vivre! The colors are very pretty-the fuchsia and black really pop, but I agree with the others it needs a little more bling on the back. How about some silver and fuchsia on the medallion and some black crystals lining the outside of the back. 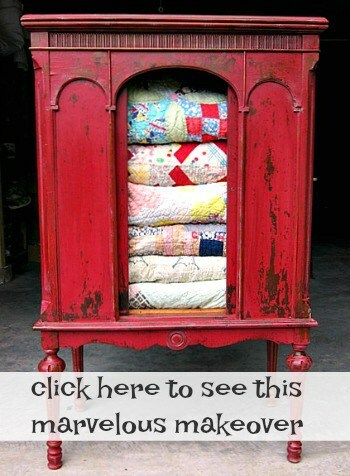 I love the idea of using old clothes for redoing the seat. Kathy, I absolutely love the chair and the black and fuchsia are just beautiful, but I have to agree the back needs something. Maybe you could take some fuchsia paint and paint a stripe around the bottom, sides and under the molding on top and that would make the molding show up really well, then maybe in the center do a stencil in the center or if you have enough material left you could decoupage it in the center. Maybe adding some gloss to the back would help. Good luck, whatever you do will be beautiful, you just have great talent and good taste. Hi Kathy, Love the chair! I too would be tempted to at least highlight the top of the chair. 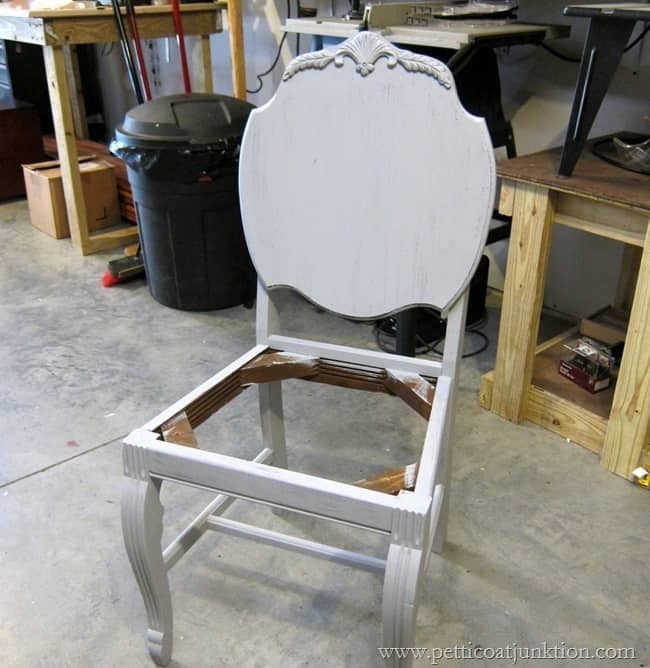 I have a question for you: I’m seeing blogs with people putting oil-based wiping finishes over chalk paint. It’s always been my understanding that putting oil-based over water-based is a no-no. 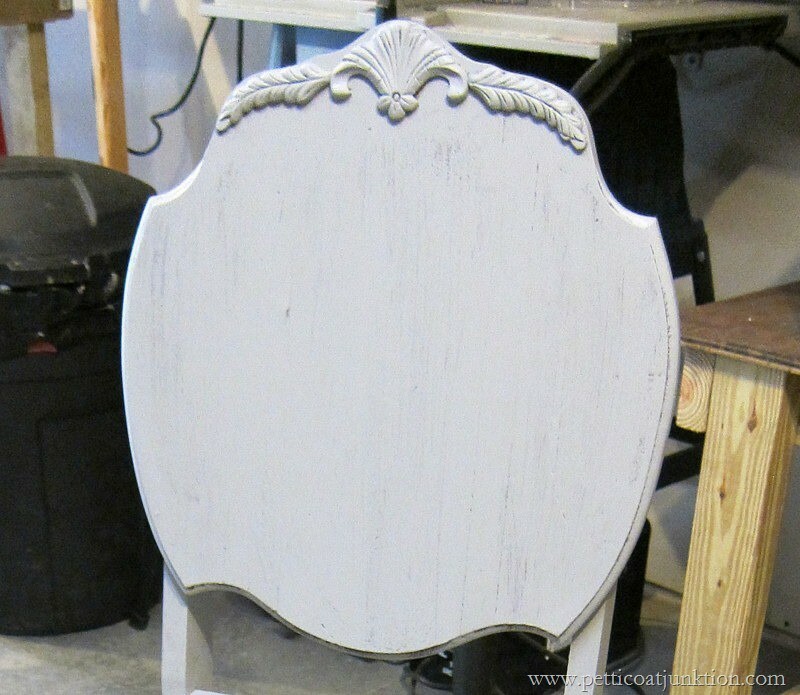 Are the “rules” different for chalk paint? Thanks, and keep the good stuff coming please! Kathy, you’ve really really got the idea! I love this chair!! I would so buy it in a minute!! I would dry brush the decorative thingy at the top of the back with silver or gold or even a little bit of fushia to highlight it. Then a touch of the same on the top of each leg in front. 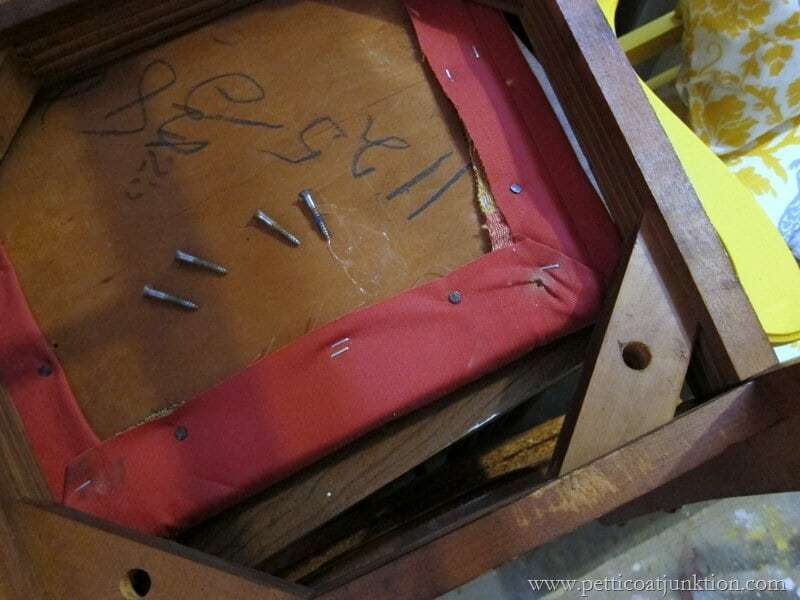 Not all the way down, but just enough to bring the legs and back of the chair together. If I had a photoshop program I would send you a picture. I LOVE the chair! I so would have purchased that chair to redo. I love the way you used your top for the seat, it really looks great. I have been following your blog for awhile. I thought it was interesting that we have some paths that cross. I live in Daphne, AL but have a booth in Franklin’s Antique Mall in Pensacola, FL. My husband lived in Clarksville for a number of years before I met him but I have visited there with him as he has a life long friend who lives there. They have taken me to the Guthrie Antique Mall when we visited…heaven!! He wants to take me to the Nashville Flea Market too, just seems like we never manage to make it happen, at least not yet! Thanks for the inspiration, I really enjoy your work! Have an artful day! Ok not a fan of the chair but I see the drama you were going for. Just not my style. I don’t think the back looks finished. Maybe some more drama on the back. Just too big of a space that is all black with nothing breaking it up. I will definitely look at my clothes differently now before they go to goodwill. I agree about the back of the chair. I will think on it some more.